Prince Wiliiam will be married in the uniform of The Irish Guards, the regiment universally known as 'the Micks." Every St.Patrck's Day the regiment is presented with shamrock by the royal family. The mascot is an Irish wolfhound. William's choice of The Micks' is quite a surprise as most thought he would take the Blues and Royals a cavalry regiment of the British Army. According to the British Army manual; The Irish Guards are based in Victoria Barracks, Windsor,not far from Windsor Castle where the British royal family actually resides. The Battalion is made up of five companies with a variety of supporting arms and is currently on operational deployment in Helmand province, Afghanistan. One of the Guards' roles in Afghanistan is mentoring soldiers from the Afghan National Army. According to Wikipedia the uniform is especially notable. A plume of St. Patrick's blue was selected because blue is the colour of the mantle and sash of the Order of St. Patrick, an order of chivalry founded by George III of the United Kingdom for the Kingdom of Ireland in February 1783 from which the regiment also draws its cap star and motto. Blue was selected because the uniform of the Royal Dublin Fusiliers, which were still in existence at the time the Irish Guards were formed, was a scarlet tunic and bearskin with a green plume. 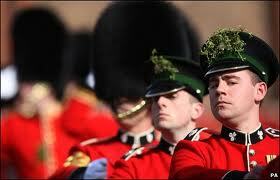 In "walking out dress", the Irish Guards can be identified by the green band on their forage caps. Officers also traditionally carry a blackthorn walking stick. Drummers and flautists, in common with the other Guards regiments, wear a distinctive tunic adorned with winged epaulettes and white lace.